Product #60521 | SKU 2-105 | 0.0 (no ratings yet) Thanks for your rating! Providing a complete single-axis lens control system with a standard torque motor packed in a hard case. 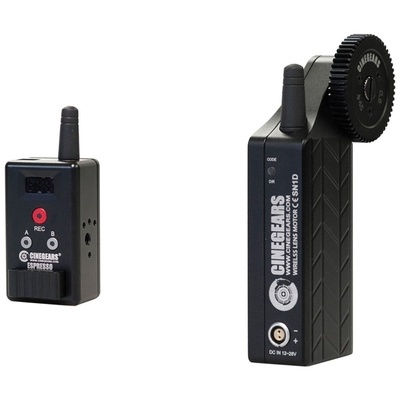 The Cinegears Single Axis Wireless Mini Rocker Controller Kit with Standard Torque Motor and Hard Case features a small-sized wireless controller that uses a mini rocker-style switch. It allows you to set up a wireless lens control motor and controller system on your camera system equipped with a geared lens and either 15mm or 19mm support rods. The rocker-style controller is most suitable to control your zoom. However, you may choose to use it to control your focus or iris instead. The controller does not have physical hard stops, but it does allow you to adjust the end points to programme stops. The kit includes 15mm and 19mm rod clamps with mounting brackets, allowing you to mount the included lens control motor on either size rod. An extended rod clamp for a 15mm rod is also included, and is approximately 7.62cm long. In addition to the replaceable cinema-style drive gear that comes with the lens control motor, the kit includes four different replacement gears with a gear mod of 0.5, 0.6, 0.8, and 1.0 respectively, in case you have to drive lenses with non-cine-style gearing or plastic lens gears. The included gear re-locator allows you to use lenses that focus in the opposite direction from standard, without having to alter your focus-pulling technique for those lenses. The side bracket allows you to mount the controller onto a 19mm support rod, or 15mm rod with optional bushing, if you wish. The kit fits into a waterproof case with foam inserts to protect your equipment during transport and storage.